The extension is capable of collecting the correspondence from multiple sources. No matter how a customer posts their request, the extension will fetch it to the proper destination. Leave the message delivery to the module, and let your Support team focus on serving the clients! Just set up an email gateway - and the extension will parse all the email messages going through it to backend, preserving the assignation and other ticket attributes. Use any mailing service you want: the email gateways support POP3 and IMAP protocols, with or without SSL/TSL encryption. The extension is designed to put your customer service in good order, and it offers all the crucial means for achieving this goal. With the extension, you can make sure that every single inquiry is taken care of timely, and no aspect is omitted or lost. 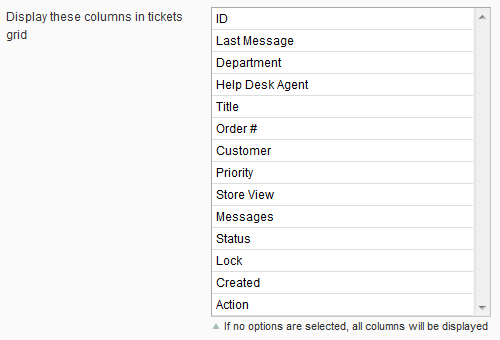 Distribute tickets between unlimited Departments and Agents and let the proper person answer each query. Queue your tickets according to their Statuses and Priorities. Use the Admin user-based ticket viewing restrictions and Ticket Lock functionality to make certain that sensitive information is kept private. From a simple request acknowledgement email for customer to reporting every step of the case processing to a supervising agent - all automated. Whenever there's a need to recover any detail of a customer's query, you'll have no problem with that, as the module carefully saves every bit of information. 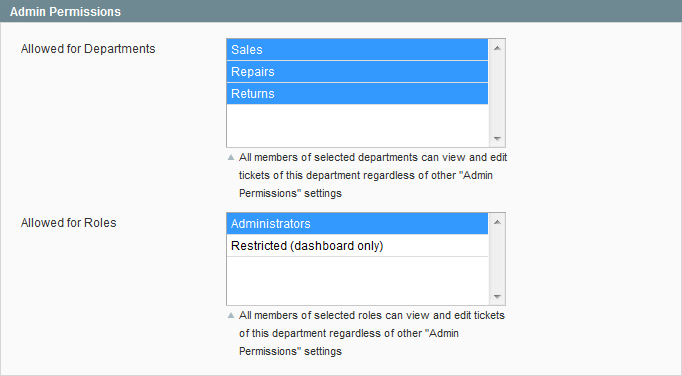 Get all the important ticket information on the grid page, including department, subject, order number (NEW! 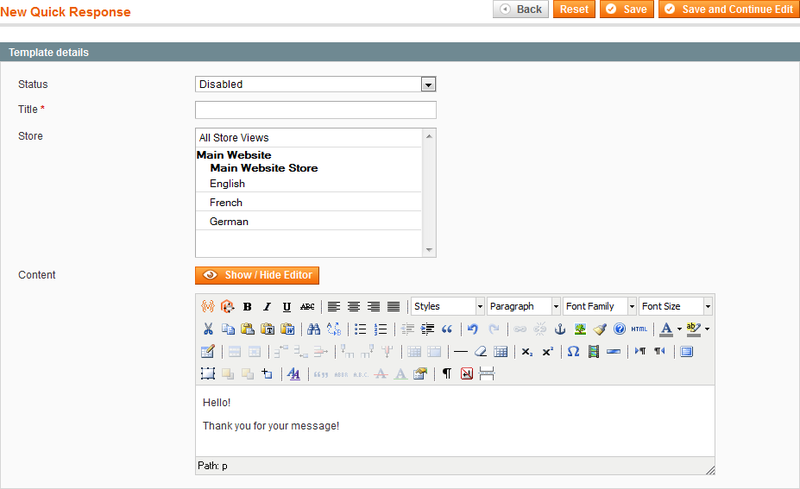 ), store view (NEW! ), rate (NEW! ), creation date, etc. 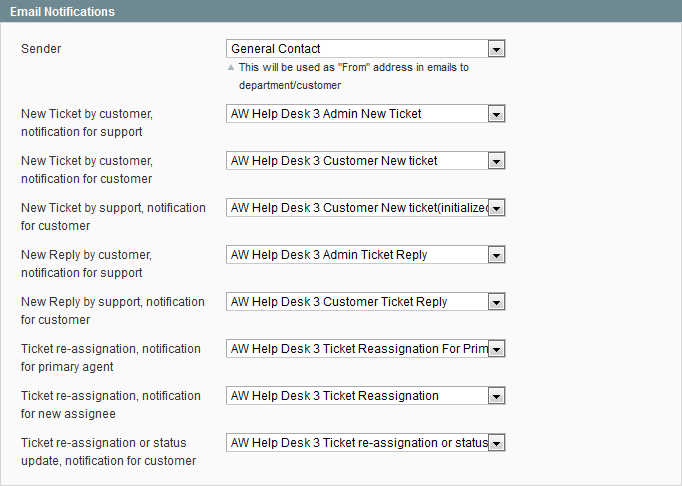 A new Help Desk Tickets tab is added to the Order View and Customer Information page to simplify ticket creation and management. For a quick tickets track, their quantity is right on the tab name. Manage tickets on the fly from the grid page in the popup window. 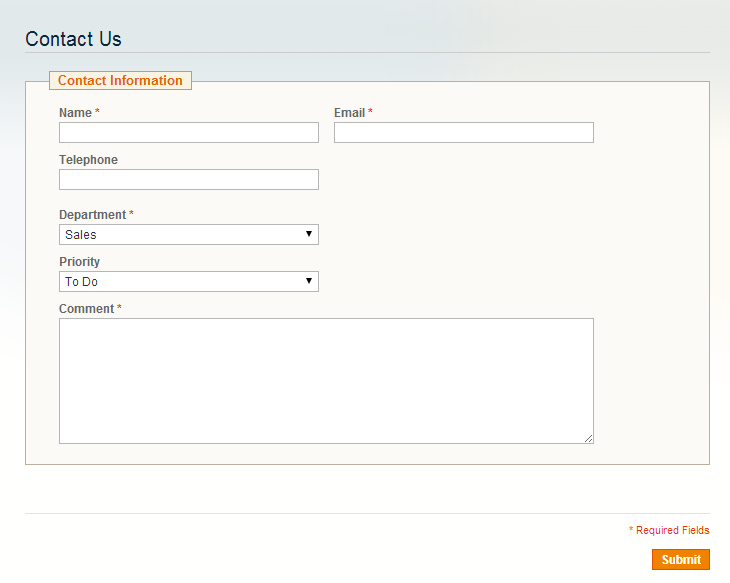 Click the Manage link for a correspondent ticket and easily change the agent, department, ticket status or its priority. 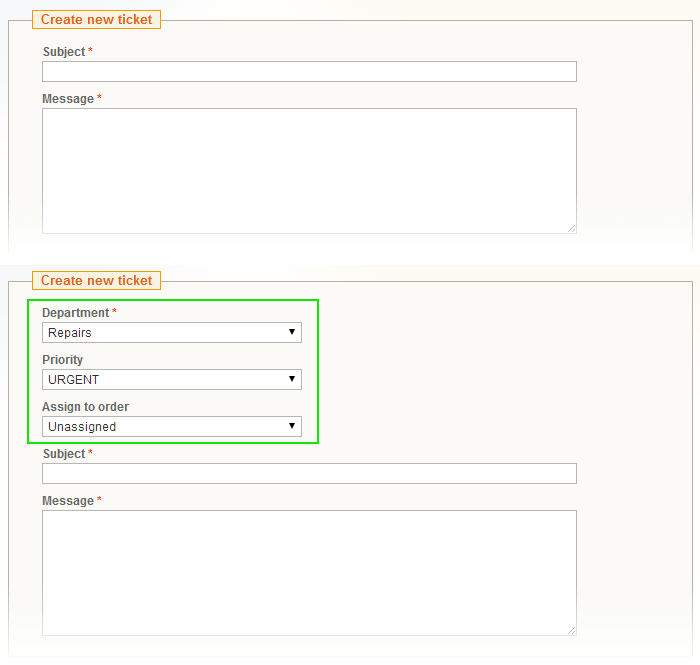 Moreover, add a message to the agent you assign the ticket to. In case you feel a customer is entitled to a little extra for his inconvenience, you may use an option to generate and deliver a coupon code right from within the ticket. Select a predefined coupon type and it will be delivered to a customer with corresponding coupon email. Monitor the effectiveness of your customer service! It is crucial to stay constantly aware of the situation is your customer service department. With its built-in reporting system, the extension presents you with everything you need to monitor, measure and control the work of your support team. Now your clients can provide feedback on support received by rating tickets from 1 Poor to 5 Excellent. Rating is optional and can be changed on a customer side any time. All correspondent information is available in the Ticket grid and on the Ticket Information page. As your agents are not allowed to change tickets’ rating, this data is a perfect base both to evaluate your team performance and to establish the best strategies & tactics for outstanding customer support service. Get the instant overview of your support staff's current load levels - per-agent and per-department ticket totals grouped by Statuses and Priorities. This reporting option is a means to analyze your client's behavior - when they submit new tickets, when they respond the most, etc. 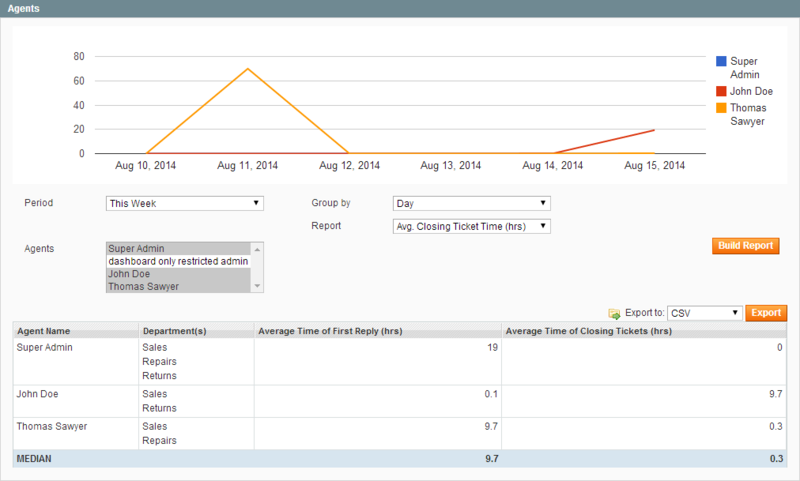 The effectiveness of each of your agents measured by the average response and ticket closing times. You can have a copy of every message that goes through the Help Desk sent to a specified mailbox (-es). Customer service is about solving problems, not multiplying them. The Help Desk Ultimate extension guarantees the accessibility and transparency of your support procedure. Your customers are supplied with all the means they need to comfortably raise, track and close their tickets. Simplify customer communications with a comprehensive and intuitive ticket management section introduced to Customer Account dashboard. Make it equally easy for your guest users to apply for support. Along with Email Parsing, the External View link gives your guests all the advantages of the Ticket View webform without the necessity to create an account. Enable your customers to lodge their inquiries to the desired destination. Let your customers be heard! Break free from expensive external services! An affordable industry-class Help Desk / Case Tracking solution that works inside your Magento, with no subscriptions to external services and/or additional connector modules? That's exactly what we are offering! 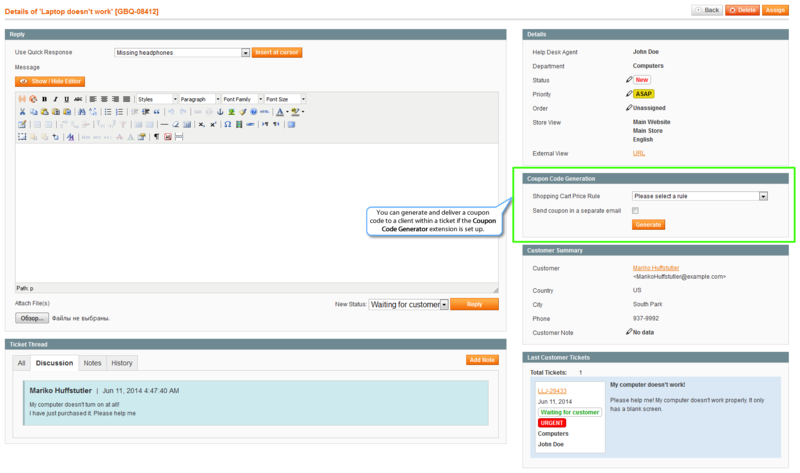 The Help Desk Ultimate extension is fully integrated into Magento and does not require any external sources to operate. You have full control over the module. Including the source code. Yes, we mean it: if the exact option you need is missing - you can add it. Get better results with less effort! Don't let your staff's time and effort be wasted on performing routine tasks: collecting customer information, typing answers to typical questions, signing the messages and so on. The extension presents an admin user with all the relevant info and options they may need to quickly respond to a ticket. Get your departments and associated options separated between your stores, so that your staff do not get lost in unrelated records. 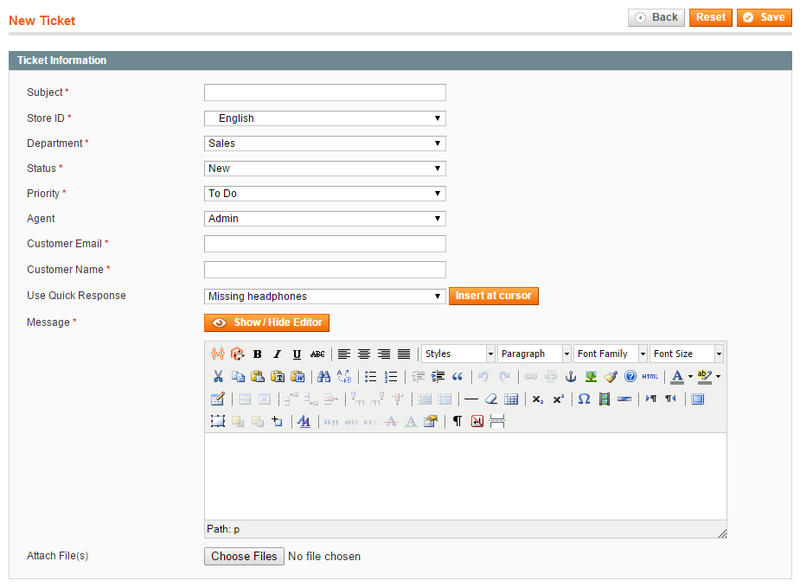 The extension allows creating answer shortcuts, that can be inserted into the message in just one click. Let the extension handle clearing your support queues by automatically closing tickets after a period of zero activity. Get the tickets cross-linked with the customer accounts and orders, and navigate seamlessly between them. Make sure the important bits of information are always highlighted via Ticket Comments and shared Customer Notes. Get the extension fine-tuned to your workflow with pre-defined filters and customizable "View Tickets" grid. Let massive data not be an obstacle - you can locate any ticket easily with the extension's built-in search functionality. Using the Help Desk Ultimate extension together with the below Aheadworks products, online merchants get more valuable insights. Convert product questions into tickets to make support staff informed about every new inquiry. Generate and deliver coupon codes right from within a ticket. Not only the extension, but the support as well. Great service for many years. Our favorite extension supplier. It is a must have extension, it has improved the efficiency of our customer care team and sped up the ticket management. 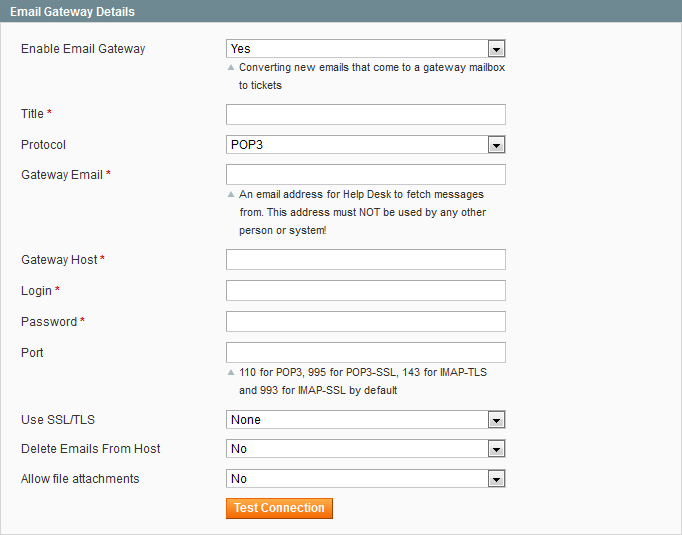 The email gateway parser is a powerful feature that allows you to track messages received via email and lets customers to reply to a ticket from email directly. Awesome Helpdesk - sorts our all my communication needs! After trying another Helpdesk extension with lots of problems at first we decided to try this extension from Ahead Works instead. It costs a bit more but it is absolutely worth it! Ahead Worsk support team is always helpefull and QUICK to solve issues. We needed some help sorting out conflicts with the old helpdesk and of corse they fixed it as always. Always a pleasure purcasing extensions from Ahead Works and can truly recommend this to! After trying several Help Desk extensions that were lacking in one area or another, it's wonderful to have this extension do everything I need it to, without having to pay for customization from developers for standard features. The aheadWorks support team is one of the best support teams I've ever dealt with. They have been very patient with issues I was having (which ultimately had nothing to do with their extension but my hosting provider). They are very quick to respond to your issues, and do everything they can to get your system working the way you want it to. I would highly recommend this extension, or any extension from aheadWorks for that matter. 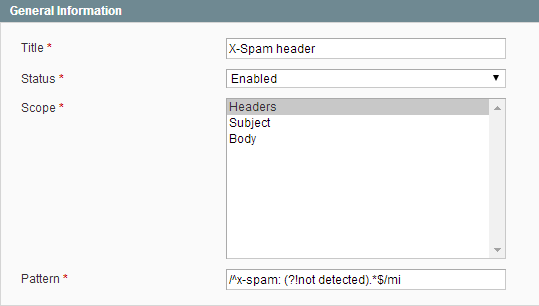 I'm running this extension in Magento CE 1.9.0.1 without any issues. Thanks aheadWorks, you folks are the best! Super System, Super Support ! We did buy Help Desk Ultimate today and after install we had a small issue. After some help from the support it was solved very quickly !! Super service !! The extension works great, it is really streamlining our support requests. Aheadworks has been very responsive and helpful when I had questions or concerns! Worked already with other help desk extensions from competitors. HDU v.2 was good but HDU v3 is really great. You have good overview about the customer, his orders in the past , his contact address and many more information so it is possible to evaluate the customer and to give a precise response to his inquiry. I do not like to spend money on software but that one I do not regret to invest any penny I have spent for it. This is an amazing extension and works great on magento 1.9.0.1. Easy install, great support. Help Desk Ultimate is a must-have extension for any online Magento store, helps you provide the best quality customer service and keep your customers always happy. We have transitioned our customer service operation to rely heavily upon this module as a way of reducing call volume. We have been thrilled with the support and the way it can link to customer orders. Have used it for multiple sites. good to use and with good tracking of customer message. This module is great all around. Customer service was starting to be a real headache with our store gaining momentum ,and the Aw module proved to be the exact solution to this problem. Managing clients' inquiries is now really easy, I recommend this ext to anyone! After testing a few other so Help Desk tools, we decided to move forward with UHD. The price and ease of implementation were exactly what we needed. It is great for both our internal Customer Service team and our customers that have questions. We recommend it. According to our pretty long-term studies it is the best Magento extension of that functionality. We have been using it for several months and now we have an apple-pie order in our multiple tickets. It took some time to handle the workflow, but now it is seamless. We definitely advise this extension for the companies, which have to work with multiple customers appeals. Before ordering this solution we looked at a lot of trouble ticket modules for Magento customer care, but went with Help Desk Ultimate because it integrates very well into the store and you do not need to use any other external software. This is especially useful if you need to enhance the satisfaction level of your clients. I believe that these guys really understand the online/retail workflow and it is shown in the design of their software. 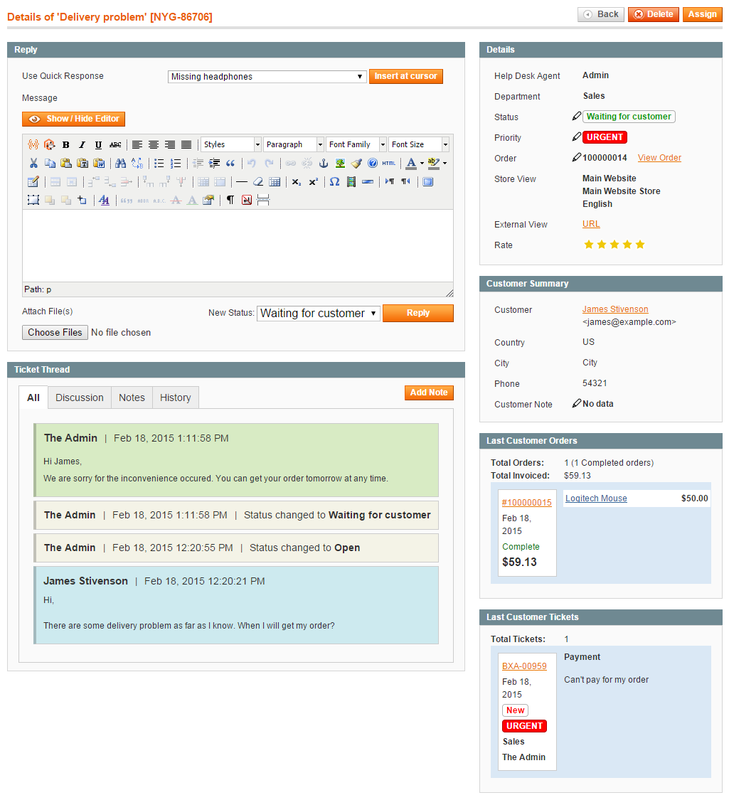 The extension covers all the bases with a wide range of user-friendly admin features. We highly recommend this extension. This module saved my client a lot of time dealing with customers over the phone. It was easy to install, and integrates seamlessly. This is an absolute MUST for any Magento system. The aheadworks team is the best one! Such a good extension ! We must must must have it!!! Simple to install and configure, work at the first try, perfect extension ! Help Desk by aheadWorks works for us very well. We needed some customization and AW team did it without conflicting other modules. We have already purchased several extension from them and are fully satisfied with the quality of code and support. Great work! This one works great and has been a HUGE help to our customer service dept. I love this extension. I was able to drop my $60 a month Kayako subscription after getting this. It makes customer service so much easier. This review is easy. You have to have a customer support function on your website, and Help Desk Ultimate is the one to install. 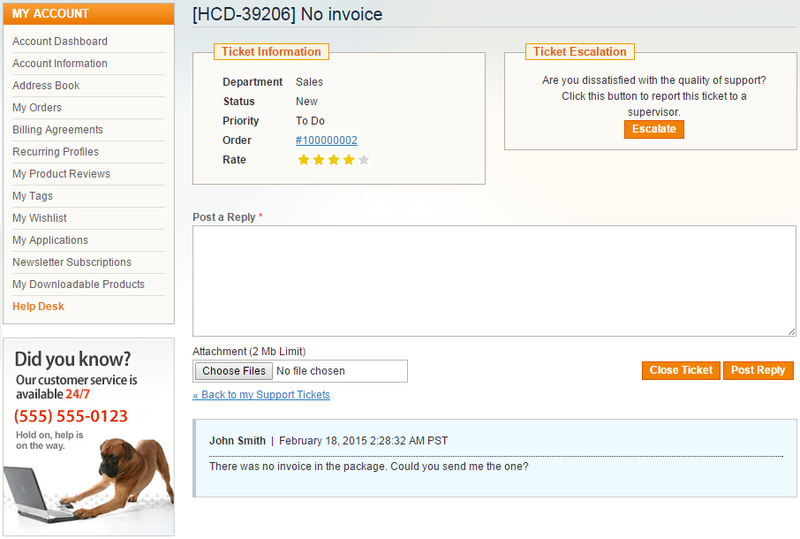 Many ticketing modules are awkward for both customers and admin, buy HDU is easy on both. Fundamentally it does all the right things, and in addition, email parsing is an great feature saving time and duplication of work, and/or eliminating missing emailed support requests. I have purchased 4 extensions from AheadWorks, I had some issues with cron which the AW went out of their way to sort it out. Now all my Sales & support is co-ordinated from one central place with standard canned responses as it was difficult to do this with individual emails. MUST HAVE for any Magento system serious about selling! This is an amazing extension and works great on magento 1.7.0.2. Easy install, great support. We purchased this over the others just because of how well it integrates into Magento. Great work AW. Product didn't work perfectly after installation. Aheadworks was great in helping us fix that problem. Afterwards, the extension is a must have if you deal with more than a couple of customer service emails. This extension has allowed us to provide a better support to our customers while saving a lot of time. Indispensable for any serious ecommerce. If you want to save yourself a lot of time (read: money), don't doubt to buy this one. Aheadworks gave me great support to get this working in a complicated theme and we are 100% satisfied! Un module incontournable et certainement le meilleur dans sa catégorie. Tout est pensé et prévu pour simplifier le quotidien. The extension saves hours with customer service and is in our opinion better than a third party on demand service. You've everything in your backend, no integration issues whatsoever, nothing. It works like a charm and is worth every single penny. Support, as always with AW, is absolutely great. You will be very happy if you buy. It does exactly what I want and it works exactly as you told. No problems during installation. A small config mistake from my own, but Aheadworks support in less that 24 hours solve my mistake! Aheadworks totally rocks in efficiency in Helpdesk Ultimate! I am not a techie and I was scared to purchase an extension fearing it has issues and I may have bought a lemon. Moreover mine is Enterprise Edition and it costs a bomb. I paid for professional installation and Aheadworks was really quick to install it. Within 5 hours, everything was done. I did a test run of the system and presto, it is working great...! My operations team have asked a lot of questions and Helpdesk was able to be configured to their needs. To Aheadworks, thanks very much for your installation. It was great, painless and efficient! 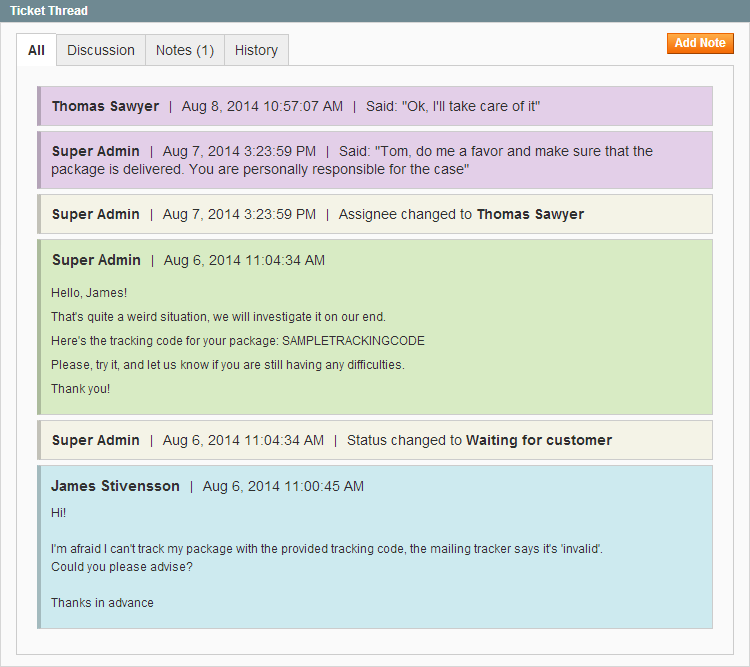 Our team has started using the Helpdesk Ultimate and I am going for the next extension soon! Worth every price! We are going to integrate with all our stores! Wow this is a great extension. So many functions are included. It will help you manage your customer service 100 times better! Best Extesion we could get, very simple to use, and easy to integrate! Help us a lot on reducing time analysing and serching for e-mails from custumer, now we have everything on one place, organized, and with the possibilty of attaching the order that produced the ticket! This module has made our customer service loads better. Installed perfectly, and excellent support from AW as usual. Ce module est vite indispensable pour gérer la relation client. tout est centralisé, c'est clair et facile de suivre l'historique. Un vrai gain de temps et de qualité du service clients. We've been using this for a couple of months now and my staff absolutely love it. Such a great way to make sure that things are not falling through the cracks. Tickets can be assigned to different departments and customers will be informed of changes and can login any time and check the status of the ticket all the way through the process. We use it for complaints, misships, returns, suggestions, site problems, and many other things. In another couple of months, I doubt any of us will remember what life was like before HDU! This module is a must-have for any successful magento business. The days of managing customers via email are gone. It's great to have tickets or contact forms our customers fill out automatically attach to their account and/or Order Number. It saves on average 1-2 minutes per customer when we have to deal with issues. That equates out to be a lot of saved time and money throughout the day for our Customer Support Team. This is so much easier than collecting contact us form emails and hoping you answered everyone's questions correctly and promptly. We've been using this for well over a year and love it! The Help Desk extension has been a great addition to our multiple store environment. Easy installation and set up. It has assisted with pooling all of our emails so that we dont find ourselves searching. Applying them to specific order is great as well. We've been using the module for more than 6 months now. Our customer support team is relying on this module for daily operation. Installation and configuration is quite simple. We only had email template issue and resolved it eventually. We have our own dev team. Originally, we were going to create a ticket system by integrating bugzilla and Magento. But this Help Desk module is much easier. One of the best modules by AW. Thanks. Cool Gadgets at Right Prices. This really is the complete help desk solution.. Really does save us alot of time in dealing with our customer responses. Installation of the extension was easy.. took me a little bit to figure out how to setup cron on my server so now it automatically creates tickets from the contact us form..
Great addition to Any magento store. Support is great. A few design formatting issues, easy fix since my template is customize.. Works well! We bought this from the very beginning to organize and secure our customer communication. Store owner and customers are happy with this, because it gives them all information and directions they need. No more lost emails, forgotten answers and inquiries. Great product! Although we are a small company, messages from the customers used to fall between chairs. Not so anymore. We are very pleased with this stable product. It might look somewhat overkill with help-desk, issue number etc, but it is well worth it. Now we know for sure if we have replied a customer (and what the reply was!). Also the different states you can put an issue in is very helpful. What we are missing is that attachments from customers are lost. In sum: We recommend this extension. Before It was getting hard to keep track of customers and their respective orders. With this it's a breeze. A must! Switched from an open-source non-integrated solution, and have to say this is well worth the money for integration and ease of use. Good support too. Very pleased with this extension. Was very pleased to find that tickets could be created from the orders area. Many other solid features contained within. Email piping would be a nice additional option. A Must for every site!! The Help Desk Ultimate is a must app for everyone running an e-commerce site. Aheadworks once again produced a marvellous, practical and very easy to install extension. Thumbs up!! This extension is fantastic, it does exactly what the description promises and more. I needed guidance figuring it out, Aheadworks was extremely helpful in assisting me. 5-Stars! I have purchased 4 extensions from AheadWorks, and I am very satisfied with both the extensions and the support I have received. Help Desk is a great investment for our store. Customers are already accustomed to "submitting a ticket" when they have a problem, so they will look for a similar function on your site. Previously we used a free ticket system, but it was not integrated with Magento and required customers to open a a different page. We paid the money for AheadWorks's Help Desk, and now if a customer submits a ticket that says only "where is my order? ", the Help Desk system will show us all orders associated with that customer, so we can help him more quickly. We do not use it yet to manage all incoming emails that we receive, just because the volume of our emails is not great enough to require this, but we will certainly use this feature in the future to help us stay organized. Help Desk is great overall! Great extension, no problems setting up or configuring. Easy to administer without having to go through tons of code. If your site has a high volume of support requests you simply MUST have this extension. Do yourself a favor and also purchase the knowledgebase extension too. While aheadWorks hasn't yet "hooked" them together, allowing customers to help themselves with the Knowledgebase then submit tickets and track them online is invaluable. This extension helps if you wish to professionalize your customer relationship. Works perfectly. I did my homework and research. I wanted to make sure I got a support ticket system that not only did what I needed but would be around for future updates of Magento and future plugin improvements. Ahead Works is a company that knows its stuff when it comes to Magento and making quality plugins. This plugin not only provides support tickets but a messaging system that is vital for good customer relations. Ahead Works sends out updates of their plugins when additional features are added or Magento upgrades. They provide great support and installation directions that are easy to understand. Hands down the best from the best Magento add-on company. This is simply one of the best Magento extensions on the market, hands down. Works great, does not touch any core files, is easy to install, and integrates seamlessly. I am very glad that I found this extension. It works great. The support is really fast and the installation service I choosed too. Respect!! 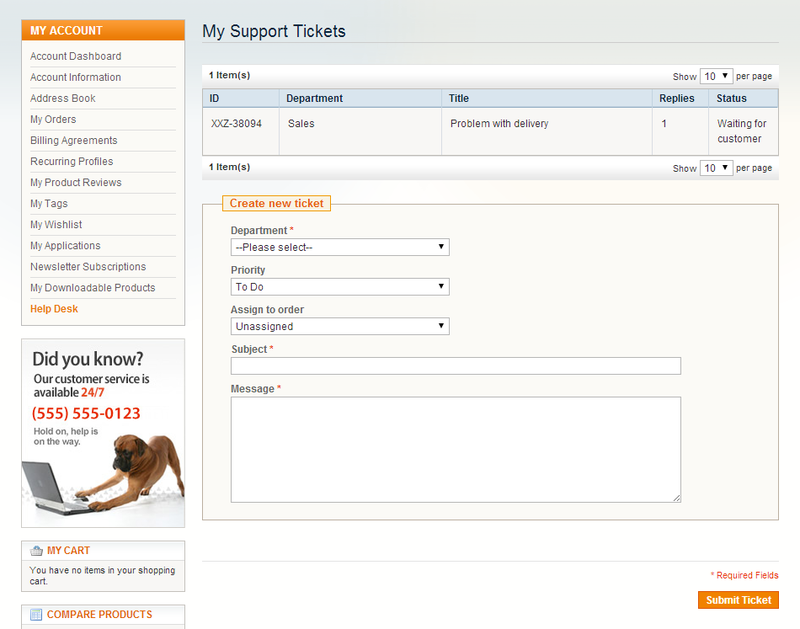 "Help Desk Ultimate" is a great extension for Magento. It integrates seamlessly, and it can be configured to highly meet the merchants' needs. I highly recommend this wonderful extension to everybody using a Magento store. Furthermore, the cost/performance ratio is excellent. However, after implementing the mod we were surprised to see the customer use the app for asking questions about their orders, getting upgrades and other sales functions. As with all mods from Aheadworks the installation was quick and painless. No core files were changed, not HTML / PHP copy/paste code snippets.... just install and go. For the price we would recommend this to anyone running an Magento site. Your customers will thank you because of the professionalism you will display and ease of answering customer concerns. This is hands down the best investment my company has made in a Magento module. It saves us countless hours in customer phone calls and has now made our returns processing more efficient. This is an absolute MUST for any Magento system serious about selling!